Rumah Hosting Review 2019: Is Rumah Hosting a Good Hosting? Founded in 2004, Rumah Hosting is an Indonesian host serving thousands of customers from multiple worldwide server locations that use solid state drives. Indonesian web hosting provider Rumah Hosting was founded in 2004. They have servers located in three Indonesian data centers as well as in a data center on the West Coast of America. Although their main website is in Indonesian, their client center has a switch to translate into a number of different languages via the Google Translate plugin. Rumah Hosting can offer good uptimes and fast speeds for customers in Southeast Asia thanks to having servers located in three Indonesian data centers. It also has servers in a data center in Los Angeles, U.S.A. They use RAID 10 SSD storage for fast disk read/write speeds, and they offer a 99% uptime guarantee backed by credits in the event of excessive downtime. They offer four levels of shared hosting that are further split into small, medium and large packages. The smallest package includes 200 MB disk space, one add-on domain, ten subdomains, and ten MySQL databases; the largest package includes 180 GB disk space, unlimited add-on domains, unlimited subdomains, and unlimited MySQL databases. In terms of pricing, there is a huge spread. All variations of the bottom two Super Saver and Super Cheap packages are – unsurprisingly – super cheap. However, the top two hosting packages (in all sizes) are extremely expensive, with prices more in line with dedicated servers. The good news is that most everyday website owners will be quite comfortable using the lower priced packages. SSL certificates cost extra on all plans whereas domain registration is free on all but the three lowest plans. Hosting can be purchased on one-month or one-year terms, and you get a small discount for purchasing the longer term. Their 24/7 technical support can be accessed via telephone, ticket, email or live chat. Each time I’ve hopped onto live chat, they’ve been quick to pick up and have helped me in English. They also have a pretty substantial knowledge base for customers who like to look for the answers themselves before asking for help. Rumah Hosting launched in 2004 and now has multiple worldwide server locations serving thousands of customers. They have a good uptime guarantee and provide 24/7 customer support. 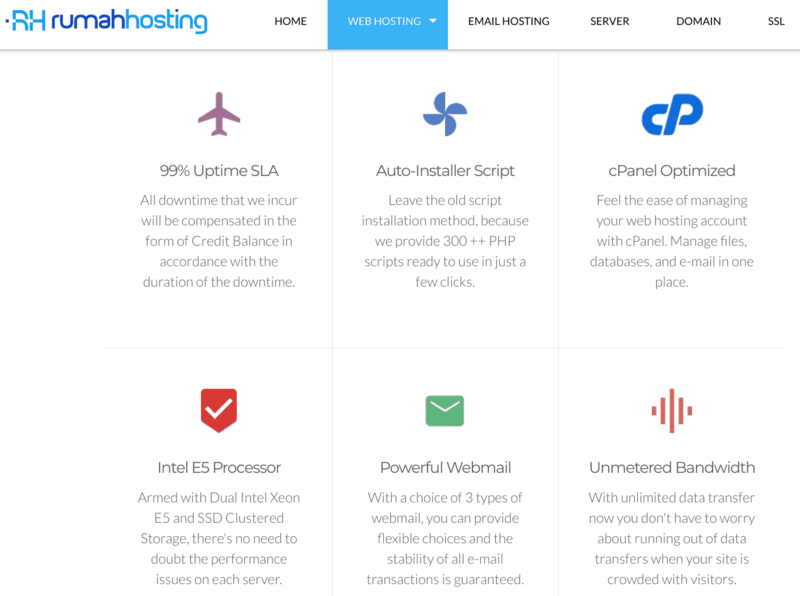 Check out Rumah Hosting’s web hosting options today! Wondering how Rumah Hosting stacks up against other Web Hosting companies? Enter any other Web Hosting company and we will give you a side-by-side comparison.